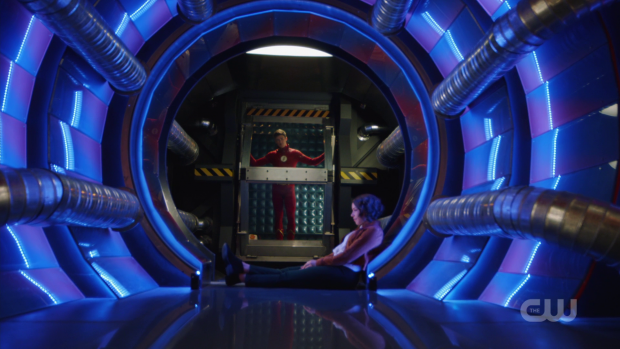 The Flash returns from hiatus with a Nora centric episode focusing on her learning that villainy isn’t as black and white as she first thought. Arguably most episodes so far this season have been Nora centric episodes but this is the first one that gives her a problem to solve on her own albeit with a fairly contrived setup. 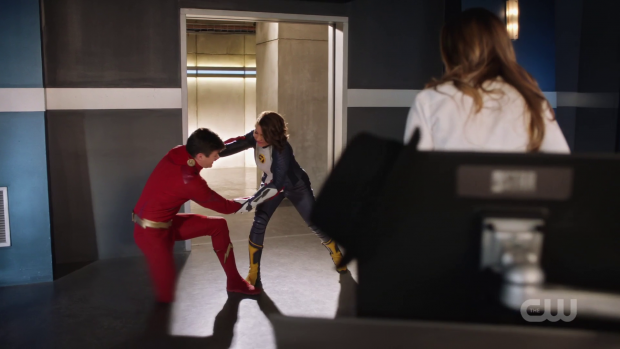 Barry having to spent most of the episode in the pipeline because an encounter with Meta-tech results in an inability to stop himself from phasing for a period of time comes across as a contrived excuse as the characters have demonstrated an ability to solve problems like this fairly quickly in the past but sidelining Barry presents a unique opportunity for Nora to take a problem and make it her own. I’ve often said that this show should take advantage of the storytelling potential of exploring different perspectives. That isn’t quite what happens here but giving Nora a villain to tackle on her own works really well as it acts as a showcase of how much the character has grown while highlighting how much she still has to learn. In this case the lesson of the week is that not all villains are irredeemable which counters a simplistic viewpoint that she has. Challenging that view becomes her arc for the episode and it couldn’t have come at a better time as her previous outlook has been shattered after finding out that Eobard Thawne killed her grandmother. The previous episode reveal that Nora has been working with Eobard Thawne was interesting and this episode picks up that thread nicely by beginning with Nora confronting Thawne about what she has recently learned. To his credit he’s completely honest with her when she calls him out on what he did. Thawne gives the excuse that he was consumed by jealousy and a desire to be like Barry despite knowing that he never could be. Nora hits back with the usual statements about Thawne never being able to measure up to Barry which he agrees with so there is a suggestion of remorse on his part. Thawne has been featured very heavily both in this show and on DC’s Legends of Tomorrow so I’m inclined to think that he’s telling Nora what he wants to hear and exhibiting what seems to be genuine regret. It’s well documented that he’s able to play on people’s emotions in order to get what he wants and there’s no reason to believe that he’s doing anything differently here. This ambiguity is why Thawne has been such an interesting antagonist since the first season. Tom Cavanagh’s performance always leaves his true intentions up in the air. Whenever he talks he seems genuine even though the audience knows that he’s being manipulative so it’s never obvious that he’s being less than forthcoming about his true intentions. When this is added to the fact that the Thawne shown in the future timeline is bereft of context at this point it becomes possible that he does regret his actions and wants to make amends. It’s unlikely that he truly does but there’s enough doubt there to make it work though I think Nora’s decision to set him free is painfully misguided given the evidence. Nora learning what Thawne did to her family fuels her arc over the course of the episode which connects to the sentencing of Joss aka Weather Witch. She assumes that Joss is evil and incapable of change because she is fundamentally a bad person. Her ability to think objectively is hampered by her inability to process what Thawne did. It basically becomes easier for her to see morality as being black and white rather than a fluid and undefinable thing like it really is. Adding to that is the fact that Joss does genuinely seem to regret what she did which doesn’t entirely work as her prior appearance did such a poor job of developing her beyond her abilities and objective at that particular time. The Joss depicted here feels like a completely different character to the one seen in this episode which is jarring and makes it difficult to accept that Nora is wrong about her. In order to earn the angle of Nora being misguided in her assumptions more work needed to be done to make it clear what sort of a person Joss is and to do that the previous episode featuring her character should have explored her motivations more clearly. Without Barry to help Nora is free to proceed on her assumptions and is obsessed with bringing Joss to justice. When she is freed during her transfer to the prison she immediately assumes that this was the plan all along and, as above there’s no reason to believe that she’s wrong about this because her quick admission of guilt could easily be read as part of a plan to secure her freedom. That turns out not to be the case as per the lesson that Nora has to learn this week but as I’ve mentioned the execution left a lot to be desired. Despite the weaknesses in the execution of this idea, Reina Hardesty plays Joss really well by adding that degree of depth to the performance suggesting that there is genuine regret over what she’s done. The back and forth between Nora and Joss is acted really well on both counts; this suggests the beginnings of an engaging dynamic between those two characters along the lines of Barry and Snart. The episode is clearly trying to create that connection judging by the references made throughout. The actual villain of the week is Raphael Van Zandt aka Silver Ghost (Gabrielle Walsh), an ex-military car thief with a Meta-tech key fob that allows her to take control of any road vehicle she comes into contact with. She uses this to steal a Lamborghini as well as create havoc with the wagon transporting Joss to prison. The notion of meta-tech is still ridiculous and Silver Ghost is really weak as villains go though there is entertainment value to be had in the high speed action sequences and her theft of what I can only assume is an early version of the Batmobile based on the references to Wayne Tech and all of the gadgets the car boasted. I did like her idea of creating a team of Young Rogues to replace the older generation. The fact that the episode focuses on Nora makes this seem like the show is setting up villains for Nora specifically which is a reasonable idea that would help her come into her own. Nora’s realisation that people can change comes organically enough. It starts with her understanding that events in Silver Ghost’s life have led her to this point as her past suggests that she was once a good person. This is further explored by a brief conversation she has with Barry about second chances. Barry’s view that part of being a Hero is seeing the good in people and he believes that everyone can change given the right circumstances. Nora directly challenges that by asking about Eobard Thawne and Barry tells her that he believes that even Thawne is capable of redemption. For me it would have been more interesting if he considered Thawne the exception which would make him a hypocrite to a certain degree though given the history between those characters it would be a position that would be completely understandable. If Barry hadn’t been so black and white about seeing the good in people no matter what then it would have made Nora resolving her feelings on the matter far more interesting as Barry’s view would have added personal bias to the mix. By the end of the episode she accepts the idea that people sometimes make the wrong choices and aren’t beyond redemption. Joss proves that to her by helping to stop the stole Batmobile which sets her up as something of a double agent within the Young Rogues. Nora clearly accepts this as a life lesson well learned and will hopefully apply this to her future heroics. I’d like to see more interactions between Nora and Joss to explore the engaging dynamic that begins in this episode. Cisco and Caitlin’s friendship continues to receive attention in ways that greatly benefit both characters. Caitlin removes the last of the shards from Cisco’s injured hand which will restore his powers to full functionality. This leads Cisco to realise that the shards were actually removing his powers which gives him an idea of how to begin developing a Metahuman cure. He mentions enjoying not having his powers because it made him feel more like himself so he considers permanently removing his abilities so that he can have a normal life free of the dangers associated with being Vibe. At first Caitlin doesn’t understand his point as she has recently accepted that Killer Frost is an important part of her that she can’t imagine being without though she does have the memory of wanting to get rid of both Killer Frost and her abilities out of fear. She sees Cisco’s current state of mind as being similar and looks to convince him that he shouldn’t be cured because his powers are part of who he is. There is a whole ethical debate to be had here that begins in this episode. Cisco feels that curing Metahumans is something that should be done because of all the dangerous people out there with powers. Caitlin makes the point that not all Metahumans are bad and is able to cite examples of times that people with powers have done a lot of good. Both sides of the argument have a point but the argument itself is really unrefined and clumsily handled though that is possibly acceptable given the heightened emotions. Cisco’s brush with death could be clouding his judgement to the extent that he equates being powerless with being safe. Of course having no powers doesn’t guarantee safety as evidenced by the routine danger that he was placed in before his powers manifested. It’s possible that this sudden fixation on having a normal life could be foreshadowing Cisco’s exit from the series which would certainly be to its detriment. Eventually Caitlin comes to the realisation that Cisco is dealing with issues that he needs to work through so decides to handle it in a different way. She is supportive of his desire to create a cure and offers to work on it with him on the condition that it won’t be used on anyone who doesn’t want to be cured. It’s an acceptable compromise and brings in another element that the show can play with. 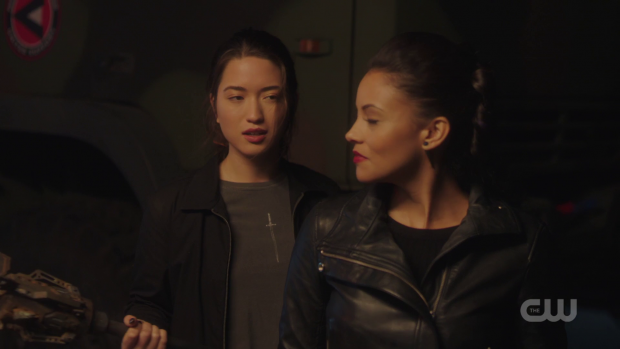 The mere existence of it suggests a moral dilemma that can be explored though for the purposes of this episode Caitlin putting aside her personal feelings in order to help her friend is the real focus and I’m always glad to see this friendship explored. A competent episode that gives Nora a more independent plot than usual and logically explores her latest life lesson. Her confrontation with Thawne over what he did to her family sets up her lack of faith in the ability of people to change. She sees people who do bad things as fundamentally bad and unable to change though has her mind opened to new possibilities through her interactions with Joss who proves that she genuinely feels guilt over what she did. This doesn’t entirely work as it needed Joss’ previous appearance to better establish her motivation but there’s no denying the back and forth between the two characters is really watchable and has potential to get better as time goes on. Silver Ghost is a weak villain with bizarre abilities but her idea of creating a team of Young Rogues is a good one and is a good fit for Nora taking the lead in this episode. 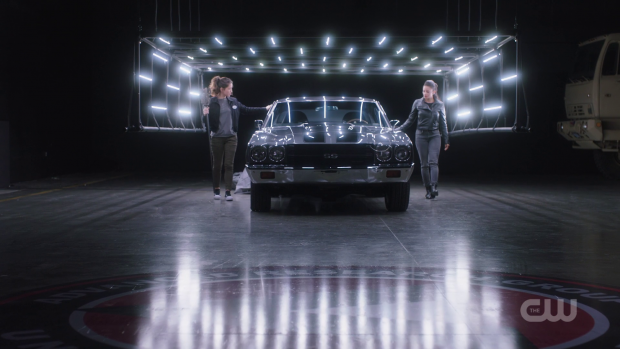 Cisco and Caitlin’s friendship receives attention that greatly benefits both characters through their discussions of a possible Metahuman cure. At this point Cisco feels that he would like to return to a normal life without powers after his brush with death. Caitlin doesn’t see his point at first as she has accepted Killer Frost and her powers as a necessary part of her life so naturally assumes that Cisco is the same. She eventually comes to the realisation that he is dealing with issues and offers to work with him on the cure under the condition that it isn’t used on the unwilling. It’s an acceptable compromise and shows Caitlin being a supportive friend. 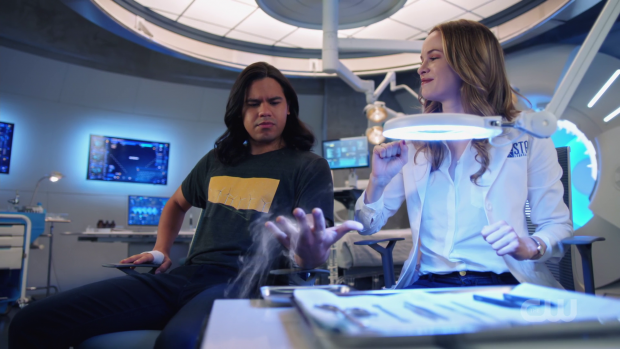 There’s an entire ethical debate to be had over the rights metahumans have and whether they are able to choose whether or not they should be cured but for now it’s a very personal disagreement for Cisco and Caitlin. Unfortunately it isn’t handled very well in a broad sense but from a characterisation point of view this was very strong.